Express your love with this artisanal marine life print, featuring a message of love. Your love is as deep and vast as the ocean. 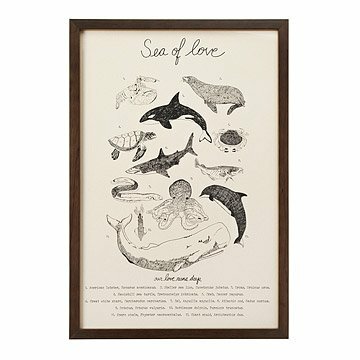 Profess your adoration for your beloved with this marine life-themed Sea of Love poster. Printed on 100% recycled newsprint paper, this artisanal 12 x 18 inch print by artist and designer Jacqueline Schmidt features 12 hand-drawn illustrations and a message of love. Made in New York. Available framed in a charcoal gray wood veneer frame with glass and hanging hardware included. Absolutely love this product and am completely satisfied with my purchase. Wish you could customize with names since they are made to order. This is a gorgeous print on a nice thick creamy paper. Definitely more cream than white. Ordered this unframmed and the first one was ruined by UPS, customer service was top notch and sent another one promptly. Perfect for a sea themed bedroom or bathroom! My husband and I just celebrated our first anniversary. Since the gift is supposed to be paper based, this was just perfect. Our bedroom is also sea themed, so it is ideal! Love this. My husband and I purchased this to use as decor and it fits perfectly with our seaside theme. Wish I would have gotten the framed version. Local stores did not have quality frames in this size. Got a simple pre made frame, looks great! Perfect art and message for our beach home.